The XV88 Broadside Battlesuit which is, by default, equipped with a twin-linked heavy rail rifle is the tank hunter of the Tau Hunter Cadres. Looking at the box, the new Broadside is much more dynamic looking model than it predecessor! 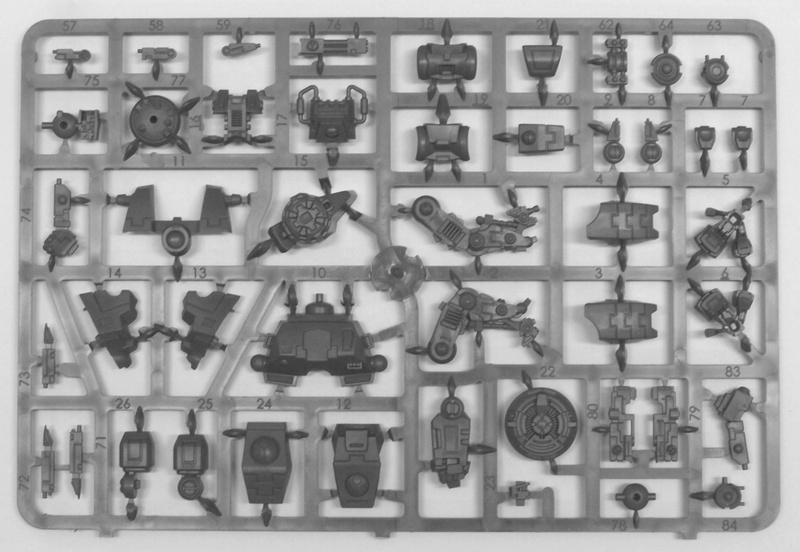 This multi-part plastic kit contains 91 components and a Tau transfer sheet with which to make a Broadside Battlesuit and two Drones. The kit comes with a Shield Drone and Missile Drone. Taking a look at the sprues I was struck by the level of detail on this kit, especially with the leg architecture, the rear cooling unit and ‘particle accelerator’, which all look great. On construction, the Broadside kit is easy to build, the various parts generally fit together snugly and require minimal pressure to hold together. There are a couple of build issues with this model, however. There are a large number of small plates and pieces that seem unnecessary in places – such as the heavy rail rifle being in 9 pieces, this could have been less. Also, the model lacks posability – the positioning of the legs is fixed, which makes the high-yield missile-pod equipped version look strangely posed. This is a shame as Crisis Battlesuits are fantastic for conversions. One piece of advice with regard to putting the Broadside together – if building a heavy rail rifle equipped suit, the arms should be dry-fitted and then glued to the body before attaching the heavy rail rifle. If this is not done, the heavy rail rifle overbalances the model and the arms droop as the glue dries. 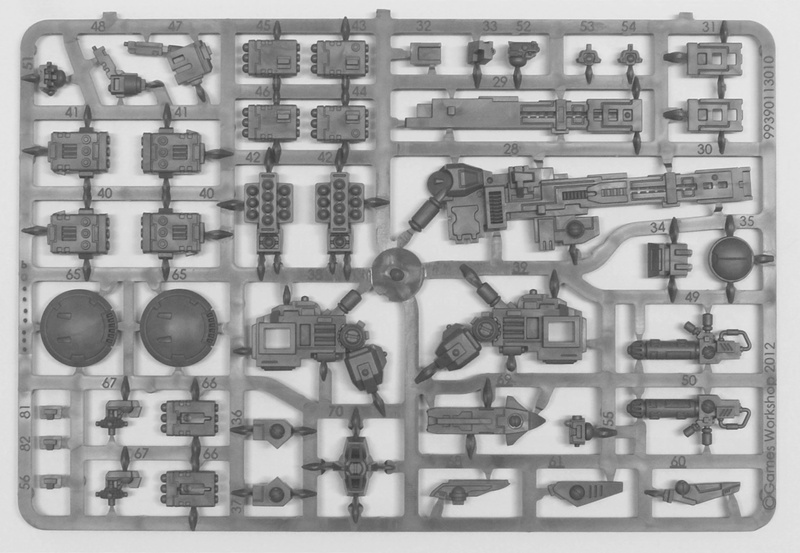 Finally, a very, very minor gripe – Parts 25 & 26 are labelled the wrong way round in the manual, these parts are the two fore-arms used on the heavy rail rifle build. This is a small error and is easy to notice. There are a good number of options featured in this kit. Of note are the 3 different heads, one traditional battlesuit head, a more ‘techy’ style head and a curved one (featured). 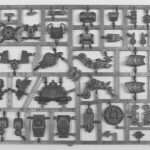 Also, as with most recent Games Workshop kits, all weapon & support system options from the codex are present on the sprue, including the 2 drones. Once built this kit looks amazing – the heavy rail rifle version being one of the coolest looking models from any army in the Warhammer 40,000 range. 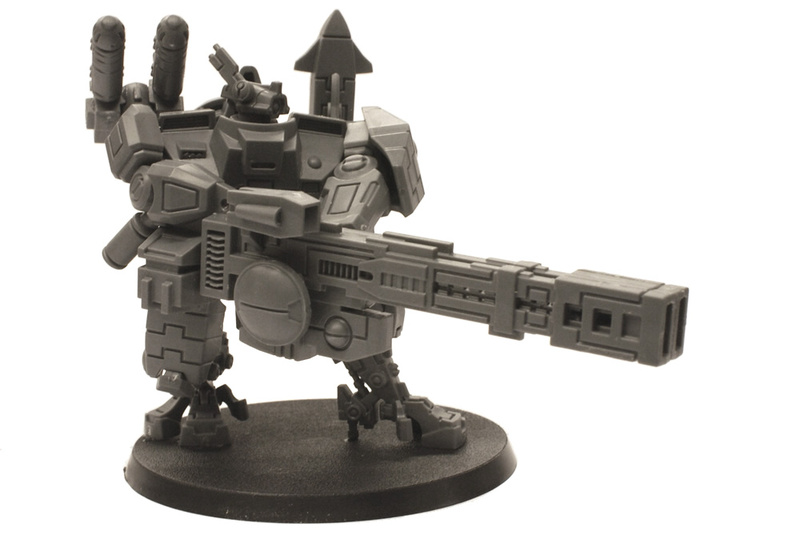 An unfortunate side-effect of this high level of awesomeness is that the new Broadside makes the standard XV8 battlesuit model look very dated. I was really hoping the VX8 would get a re-sculpt with the release of the new codex, switching to under-slung weapons would have been a big plus on the XV8. Although this is not a gaming review – I feel a quick note on the Broadside in the game is required. Tau veterans will have noticed that I have talked about a heavy rail rifle rather than a rail gun in this review, I’m sorry to say that the Broadside no longer totes a rail gun, rather a slightly lower strength (strength 8) heavy rail rifle. On the flip side it is now only about two thirds the points cost that it used to be. Finally on to value for money, at £30 RRP – this is an expensive kit, several pounds more than the kit that it replaces. That said, you do get a lot more for your money in terms of model size and options. All in all this is a very good kit. It looks great, is enjoyable to build and includes a good number of options. However, a certain amount of conversion work is required to make a squad of 3 suits look suitably diverse.